Since 1962, 24HR Home Comfort Services is your best choice for repair, installation, and service in homes and buildings just like yours in the Wisconsin and Northern Illinois. We take special pride in the craftsmen we train and employ--a fact you'll see in their reviews below. Its also noticeable immediately in the attitude and integrity our technicians bring to your job site. Our entire company works hard to make your experience with us hassle-free and enjoyable. You can also be assured that 24HR HCS stands behind the work we do as well as comply with all local codes. This is why, as you can see by the map and reviews below, we are rated so highly for Furnace Repair and Air Conditioner Repair in La Valle WI. Call us today at (608) 868-6411! We are 24HR Home Comfort Services,Your Home Comfort Champions! Call response poor, service and cost was good. Found furnace to be not working at approx. 6am. When I called for service (6:45am) I got an of beat answering service, which 1st was a girl, that put me on hold. Then ended up talking to a guy, and still got placed on hold for no reason that related to me. Then guy told me he would leave message for office, and they would call back at 8am. It was already down to 59 deg. in house. At 8:19am I hadn't recieved a call, so I called in to office. Lady at office said they were stil going thru messages. She said let me see what I can do, then told me they could have someone there between 12noon - 2pm. I immediately said 4 - 6 hrs. more, unexceptable!! So see said let me check something. Then came back stating that someone would be here between 9am - 11am, and I said ok at this time. When service gentleman arrived a little after 10:10am, everything went pretty well from there forward. Was glad the service rep. checked things in detail, and glad lady at office did a good job checking into warranty for us to keep cost to $0.00. Travis was extremely prompt, friendly, and informative. Extremely impressed with service call. Annual maintenance on 15 year old air conditioner. Air conditioner not running. Diagnostic showed bad capacitor, replace and checked system. 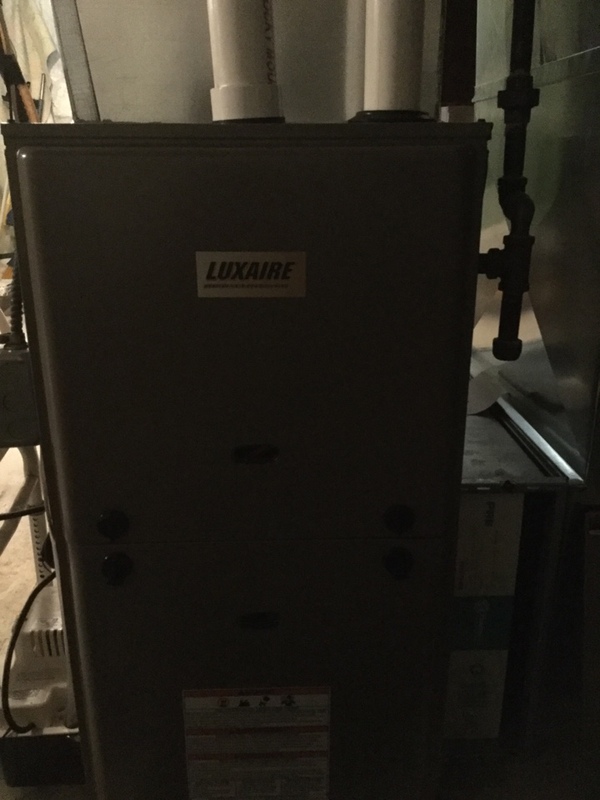 Annual maintenance on Luxaire furnace and air conditioner. Luxaire furnace motor OHMED out. Repair veritable speed blower motor on Luxaire furnace.